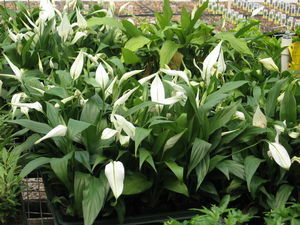 Milmont Garden Center offers a large array of foliage and ornamental houseplants. Following is a list of plants as well as some basic instructions for their care. Because our stock of indoor foliage plants changes so frequently, please call to be sure we currently have an item in stock. To download the complete article, please see "Indoor Plant Culture." Keeping plants clean and neat through regular grooming improves the appearance of plants and reduces the incidence of insects and disease problems. Remove all spent flowers, dying leaves, and dead branches. Keep leaves dust-free by washing plants with warm water and mild true soap – avoid detergent, which can cause damage to leaves and buds. Cover the pot to prevent soap from entering the soil. If tips of leaves become brown and dry, trim them off neatly with sharp scissors. 22481 Nepenthes Pitcher Plant 6"
18245 Nepenthes Pitcher Plant 8"
10397 Strelitzia Nicolai White Bird of Paradise 10"
Humidity can be increased by placing plants on trays lined with pebbles and filled with water to within one half inch of the base of the pot. If you heat with wood, keep a pot of water on the stove. Most plants should not be watered until the soil feels somewhat dry. There are commercially available water meters to determine the soil moisture content of con­tainer and garden-grown plants. However, the old tried and true method of sticking your finger into the soil is the most reliable. With experience you can lift a con­tainer and judge its water content and thus its need for water. Apply enough water to thoroughly saturate the potting soil. In most cases, the soil is saturated when water drains from the bottom of the pot. Placing a sau­cer under the container eliminates water damaging the surface where the container sits. In some cases, such as a root-bound plant, water will drain from a container before the potting soil is saturated. In this case, fill the saucer with water and allow it to be absorbed into the container. Make sure to empty the saucer once water is no longer being absorbed. Fertilizers are salts and if you do not water thoroughly, salts can become concentrated in a potting soil. High soil-salt concentrations are toxic to roots and can kill a plant. So, regardless of your fertilization method (solu­ble or slow-release), thorough irrigation is necessary to keep salts from building up in the soil. To further avoid salt toxicity and to be on the safe side, one can always use less fertilizer than the recommended rate. When the weather warms in the spring, houseplants can be put outside. Don’t be too anxious to move your houseplants outdoors, as even a good chill can knock the leaves off tender plants. To avoid cold temperature damage, find out the minimum temperature your par­ticular indoor plants can tolerate. Make sure the out­door light conditions are compatible with those of your plants. Plants can get “sunburned” if you move them from an average indoor light exposure to a full sun exposure of the outdoors. Avoid windy locations, since such exposure can tear leaves and accelerate water loss and increase watering frequency. Houseplants that have been outside all summer should be allowed to make a fairly slow transition to indoor conditions. Quick changes in environment can result in yellow foliage and leaf drop. To avoid injury, bring plants indoors before temperatures dip below 55°F, do not wait for frost warnings. Check for insect pests before you move the plants; it is easier to get rid of pests while plants are still outside. Rinse the plants’ leaves, and soak pots in water for 15 to 20 minutes to drown most soil-dwelling pests. To download the entire article, please click here. This publication was originally authored by Diane Relf, Horticulture Extension Specialist (ret. ), and Elizabeth Ball, Program Support Technician, Virginia Tech.